All southbound lanes on the 710 Freeway in Bell have reopened after crews finished repairing damage from a massive tanker truck fire over the weekend. BELL, Calif. -- All southbound lanes on the 710 Freeway in Bell have reopened after crews finished repairing damage from a massive tanker truck fire over the weekend. All four lanes of the 710 from Atlantic Boulevard to Florence Avenue reopened shortly before 4:45 p.m. Monday. Earlier, Caltrans officials closed the connector from the southbound 5 Freeway to the southbound 710 Freeway Monday morning to limit traffic from entering the area. The northbound lanes were reopened around 9 p.m. Sunday. 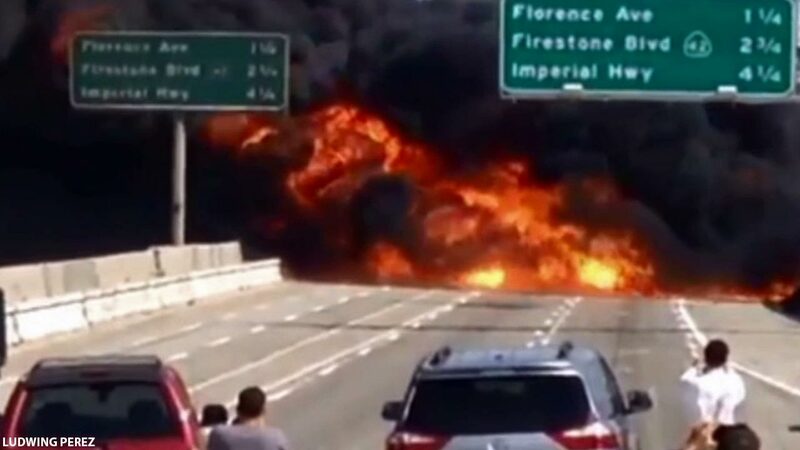 Massive flames shot up in the air and thick smoke was seen for miles after a tanker truck exploded on the 710 Freeway in the city of Bell on Sunday, April 26, 2015. The tanker crashed south of Atlantic Boulevard at 3:30 p.m. Sunday between Slauson Avenue and Bandini Boulevard, according to authorities. The driver, along with a passenger, was pulling a double trailer. At some point, the driver heard a popping sound and saw the second trailer begin to tip over. The driver pulled over and the pair ran from the truck. "He heard a loud pop. He looked in his rear view mirror and he saw that he either lost a tire or experienced a flat in his rear trailer. At that point, he saw that the trailer had overturned," said Officer Juan Galvan with California Highway Patrol. The tanker had 8,500 gallons of fuel in two tanks, but only one burst into flames. The smoke was visible for miles. "A tanker fire burns well over 2,000 degrees and it was burning for a while. It's also moving. So that causes the concrete to fail or basically crumble. You can basically walk on it and kick away pieces of concrete. So that means we can't have cars on it," said Chandler. Los Angeles County Fire officials said no injuries were reported. Another tanker truck was brought out to capture the remaining fuel, which amounted to approximately 4,000 gallons. That fuel was picked up before ever reaching the L.A. River. Caltrans crews were working as fast as possible to repair the damage. The freeway spans 120 feet across four lanes plus the shoulder. Officials say the road was burned so badly, that it was not safe for cars to drive on. The affected stretch of the 710 was repaved before lanes reopened to traffic. Firefighters used foam to put out the flames. Capt. Keith Mora said firefighters had to drag the fire hose across the northbound lanes over to the southbound lanes to put out the fire. "We're containing the spill of gasoline, so that it doesn't go any further south, with crews that just are diking and damming," he said. "We also had a small area of brush or grass, about 100 feet, that caught on fire." Drivers trapped in snarled traffic said the scene was terrifying.